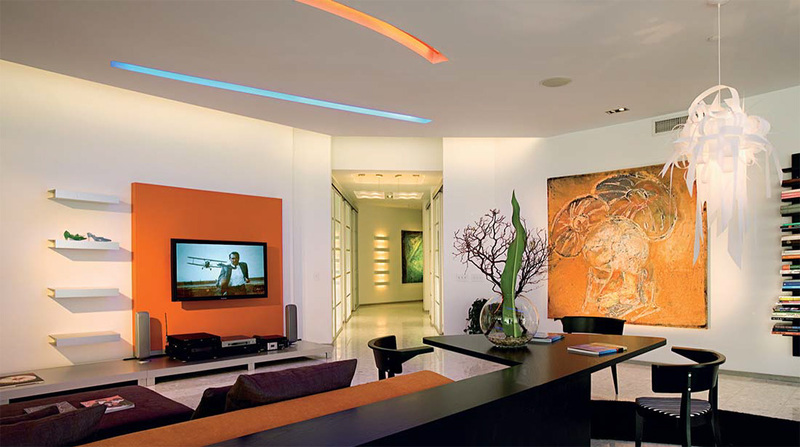 Oscar Glottman, architect and designer from Miami counts as one of the pioneers of puristic design. Some trends in the world of interior design are more than astonishing: While European High-Class-Designers are currently seeking inspiration from US design, glamour and extravaganza; their American counterparts are discovering the interior design world of good old Europe. 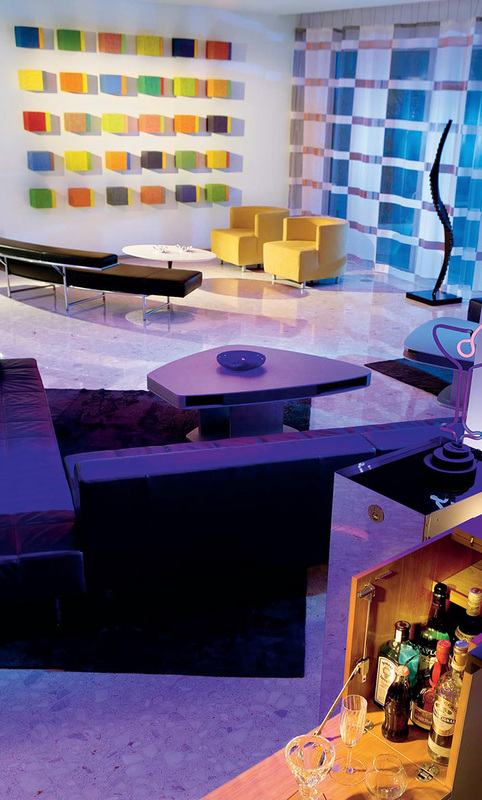 In this regard, Oscar Glottman, architect and designer from Miami counts as one of the pioneers of puristic design. 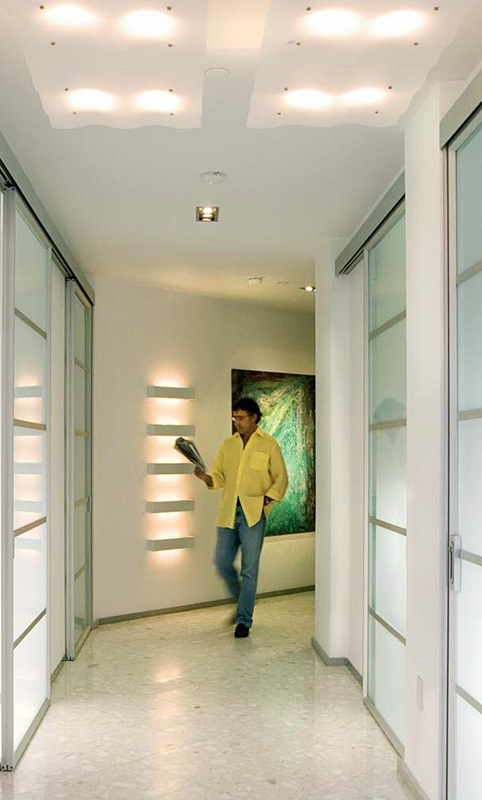 Before opening his own showroom in the Miami Design District in 2001, the American with Colombian roots had first studied at the architectural association in London and the University of Miami before completing his degree in architecture. With an unmistakable sense for upcoming trends and niche designs Glottman usually gets his best ideas from the furniture fairs in Milano and Cologne and also seeks inspiration from avant garde stores such as “Colette” in Paris. Recently, Oscar Glottman was approached by Chrisanne and Giovanni Grimaldi who at the time were looking for children’s furniture (a rather European specialty). They also started gathering ideas for their new apartment on Fisher Island, an exclusive private island near the famous South Beach. Giovanni Grimaldi, who grew up in a house in Neapel, Italy, that was designed by Gio Ponti, was excited about living in an ultra-modern home. 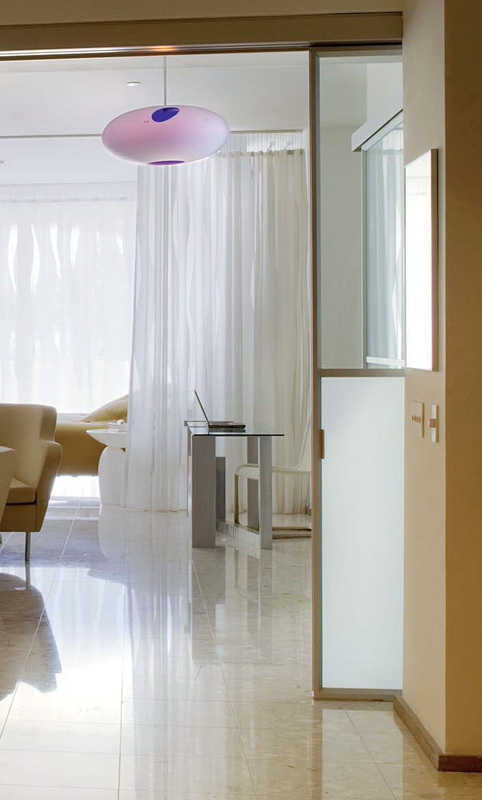 When it comes to minimalist design, Oscar Glottman’s name is well-known in Miami: His creative and sophisticated approach in architecture and interior design, as well as in lighting, furniture, and sound design has produced a portfolio of international projects. Unique and extravagant is his lifestyle showroom in the Miami Design District: Glottman Architecture.Design.Furniture offers design incorporating construction systems along with design furniture, kitchens, closets, lighting, and accessories, strongly represented by European lines. In contrast to her husband, Chrisanne Grimaldi was less enthusiastic about a minimalist design for their new home. As Chrisanne remembered: “Whatever my husband liked, I usually found horrible. Like my grandmother I grew up as a typical American. And that means cozy furniture and many antiques.” The mother of four also couldn’t envision the final arrangement of their new apartment. Says Grimaldi: “We lived in Italy for many years and I wanted something typical, classical Italian – silk on walls, for example. But to combine children with minimalist design, that was hard to picture.” – Was it possible that a cool environment would provide enough warmth for a young family? Chrisanne, who grew up in Buffalo, N.Y. and met her husband while studying abroad in Italy – wanted both a representative yet children-friendly home. Chrisanne took over the planning of the children’s section while her husband and Glottman – whose sense of aesthetics she admires – dealt with the rest of the apartment. When Glottman first saw the apartment he knew that nothing would stay the same. Says the architect: “The first thing I noticed was the horrible foyer. When you entered the apartment you immediately stood right next to a pair of ugly swing doors that led to the supply rooms. It was a truly dark and not very inviting place” Glottman had the doors replaced by moving elements made out of glass and aluminium that offer lots of natural light and provide a more refined atmosphere. Also the connection between the bedrooms and small closets was completely altered. The new dissection suggests a loft-style apartment with alternating bathroom, seating and sleeping areas. 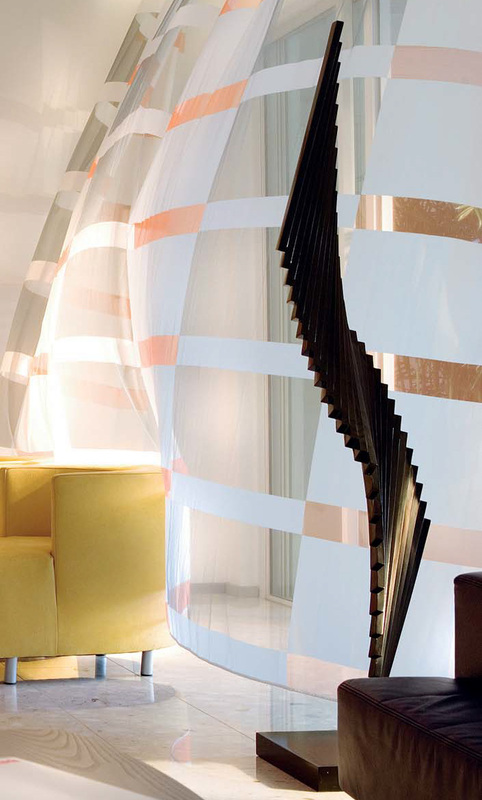 The bed is framed by transparent curtains with a wave motif – a flexible element that provides a private atmosphere. As Glottman comments: “The lower parts of the sliding doors are made out of milk glass, the upper parts are clear. When you are sitting in the bath tub nobody can see you, but when you are standing up you can enjoy the view outside. And the walk-in shower is framed by a glass wall and an ocean-green mosaic.” The Grimaldi family is still amazed by the new look of their apartment. “When the walls were torn down we couldn’t imagine in our wildest dreams what it would look like today. The planning was radical, and we should really build Glottman a monument. It was fascinating to witness how this room was transformed – from a mouse trap without any light to a bright place pervaded by the colours of the ocean and the trees. 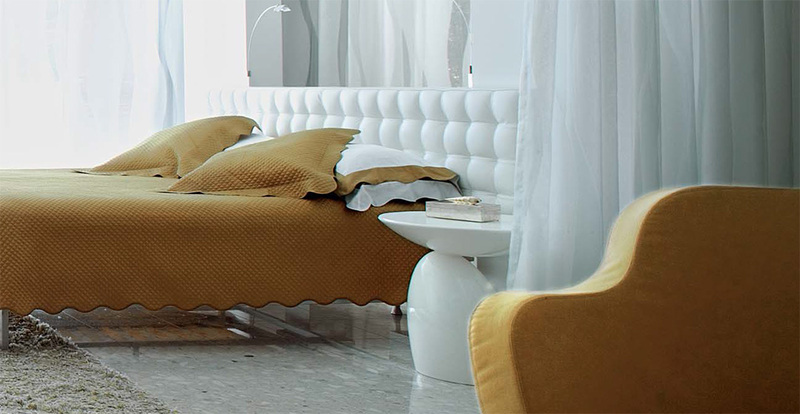 For the sleeping area Glottman and Grimaldi picked modern furniture in earth tone colors and subtle materials: an elegant bed cover made out of white leather, in addition a table made out of glass and aluminium by Jane Manus. The curved sofa was designed by Anna Kraitz for the Swedish company Källemo. Next to the white vintage armchairs by Kundalini, a bench made out of lime stone invites to relax. From time to time guests come over from the living area and hang out here. The color selection in the living area is much more powerful. A low, custom-made bookshelf and a gigantic desk inspired by El Lissistzky – the Russian Avantgarde designer – divide the room. Meanwhile, white walls and terrazzo tiles in grey and white round the room up. On one side of the room you find classic European furniture pieces, as for example the Eileen-Gray-sofa; on the other side the blue custom-made leather sofas are framed (delete: in) by a newly made coffee table à la Jean Prouvé. Many of the seating arrangements can be used on both sides, and the brightly illuminated ceiling lights open up the room and create width. Colorfully painted cubes hang from two opposite walls; they are an installation by the Dutch artist René Rietmeyer. And the silver boxes from the German company Tecta appear minimalist when shut, yet like a puzzle when open. In the dining area, which originally served as a patio, now stands a Jean Prouvé table right next to a zebrano wooden sideboard by Tagliabue. The black dining chairs appear as sculptures. “They might not be comfortable but function as pieces of art”, says Glottman. “The landlord agreed with this choice.” In the end, there is real art on the walls, such as an original piece from Roy Lichtenstein. In the glass cabinet awaits us another surprise: an ocean giant made out of silver plated metal. It was designed in the fine French blacksmith’s shop Christofle and is a wedding anniversary gift once made by Grimaldi’s wife. For Glottman the planning stands and falls with the details. Explains Giovanni Grimaldi: “Also for us they are important, such as the seams of the couch as well as the splices between the tiles. I didn’t want the usual splices that tend to darken over-time. For this reason we used a special kind of rubber.” Minimalism works only with this kind of precision. In this case maybe rather look for a new hideaway – bigger and with much more space for more amazing furniture creations from the Old World.